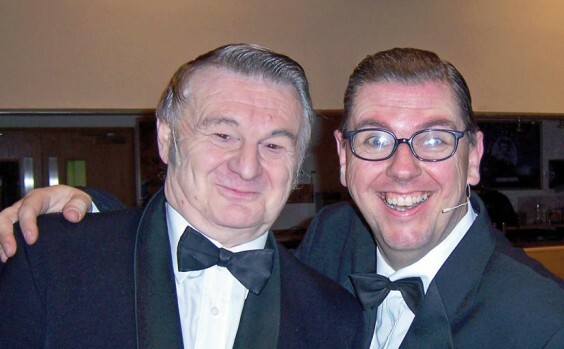 Like many, I was brought up on a healthy dose of Morecambe and Wise over the years and must confess it was with some trepidation that I entered the foyer of the Artrix Theatre to “relive the fun and laughter . . . “ as the blurb promised. Now, our Eric and Ernie are still a national institution and remain much loved. Anyone taking their story on and in character must be very confident indeed. Enter David Sanders and Max Martin with their own particular take. And, it must be said, not a million miles away from the original double act. In fact, so uncannily effective, this offered the appreciative audience a rare opportunity of enjoying the next best thing to a live performance of our actual heroes in action. The show opens just as World War II decided to start its own six-year international run. The boys are encouraged by Eric’s mum, Sadie, to work together and apart from a brief flirtation in uniform for Ern, the rest is geography. “Don’t you mean history?”, “Don’t change the subject!” retorts Eric. This evening’s performance captured the style effortlessly. Good timing and the ability to involve the audience only endeared the duo even more. One thing is certain – there’s no shortage of material! “Many of our peers pointed out early on in our seven-year partnership we were ideal for the roles, before we actually formed the act”.